I’m not as fast as Peter Müller. The chief driving instructor for one of the most revered exotic car companies in the world can turn in lap times that would shame my best efforts, all while giving me notes over the radio and steering with one hand. He’s quick. And still, I kept catching him, even slowing down for him, on the fast, sweeping Turn 3 at Circuit de Catalunya. On Müller’s advice I held a mid-track position just past the halfway point of the corner, then tightening towards a very late apex and flat out acceleration into a short straight section. Müller was leading a $1.5-million pack of Lamborghini Aventador LP 750-4 Superveloce supercars, and driving the standard Aventador himself. Forget that the SV has added nearly 50 horsepower and dropped around 110 pounds versus the ‘base’ model; those are just numbers. The SV makes a hack like me as quick as Lamborghini’s top trainer, for at least one glorious corner. This is a special car.It’s hard to describe Lamborghini’s 6.5-liter V12 masterpiece without using indulgent language. But it’s the reworking of this massive engine that starts to explain my Turn 3 pace. The engine drives an impressive set of output and performance figures: 740 horsepower (the eponymous “750” figure of the model name is a metric horsepower quote), 509 pound-feet of torque, 0 to 62 miles per hour in a scorching 2.8 seconds, and a top speed in excess of 217 mph. Lamborghini president Stephan Winkelmann says the use of naturally aspirated engines is “part of our DNA.” That dedication makes for a powerful differentiator in our current turbo-sodden area, and a magical experience in the case of the SV. The added output and “enriched torque curve” have been achieved by way of revised variable valve timing and intake, as well as a new lightweight exhaust system. Power comes on with authority even under a few thousand revs, and rises maniacally as long as you’re inclined to keep the accelerator pegged. The V12 spins freely and fast, hammering home the need for a ultra-responsive transmission with each run up to the redline. Of course, the bellow of the car is such that I hardly needed the gear indicator on the digital tach to tell me when to shift. The V12 sounds luscious at low speeds, angry at full throttle, and absolutely murderous approaching the 8,500-rpm cutoff. Unless you’re deaf you’ll quickly learn when to pull on the shift paddle, while keeping your eyes on the blurring road.The hardware of the seven-speed, Independent Shifting Rod (ISR) transmission carries over from the standard Aventador, but the programming has been completely reworked. I drove a bit in all three of the management programs – Strada, Sport, and Corsa – that govern ISR reaction, and fittingly Corsa was perfect for the F1-flavored venue. The transmission pounds out visceral shifts with speed that approaches the unbelievable. Lamborghini says its single-clutch, automated manual transmission will change a gear in 50 milliseconds; unless you’re in the business of building racing transmissions, that number doesn’t mean much. But in practice it allowed me to be in exactly the gear I asked for, the instant I asked for it, while traveling at a pace that would be ludicrous anywhere but a racetrack. Selecting Corsa also changes the defacto torque split for the Aventador’s all-wheel-drive system, and the damping rate of its MagneRide suspension. I did my first four or five laps in Sport mode, assuming that it would be slightly more forgiving as I learned to handle the creature at high speeds. That turns out not to be the case. Corsa sharpened the throttle response and dramatically increased shift speeds, both of which helped me to know exactly how the car would respond, and when. But the setting also sends about 10-percent more torque to the front wheels, which made a gigantic difference when pulling quickly out of the many slow corners of Catalunya.I fell in love with the smaller Huracán in Spain last year, and I’ll admit that I didn’t expect even this race-prepped Aventador to be as good. But from the first lap in the SV I knew I’d made a wild underestimation. The variable electromechanical steering in the Superveloce is shocking in its speed and ease of effort; delivering a dossier of information about tire/road relationship in each corner. Turn-in is utterly immediate, and Lamborghini’s Dynamic Steering system ensures that the ratio is efficiently matched to the road speed. All of this is improved by the lighter curb weight, of course (thanks to a significant carbon-fiber diet). The gram-perfect new wheels help, particularly with that nippy turn-in. 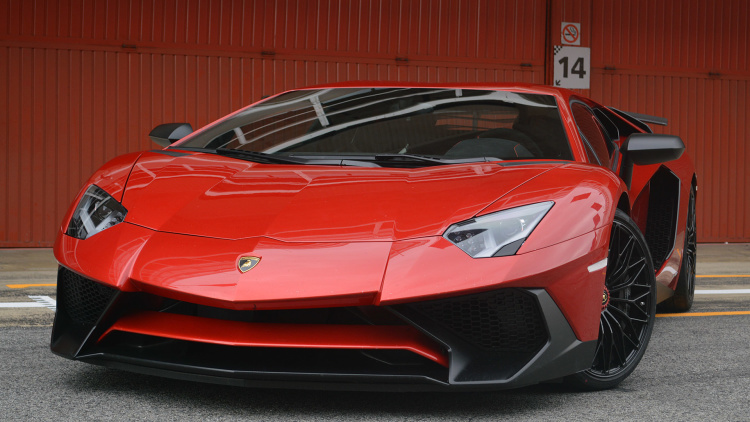 The Aventador makes use of an exotic, racecar-like pushrod suspension combined with magnetic dampers. It’s a variable setup that keeps the SV almost perfectly flat under high cornering loads, with the rear wheels in unbroken contact with the tarmac. Those wheels wear 355-section Pirelli P Zero Corsa tires (255-width in front) meaning a level of grip so high that I had to get a little silly before even this 740-hp kraken would step out unasked for. (I started to spin while greedily trying to push Müller in the two slow corners that one must suffer through before the long start/finish straight. )In a sense it’s disappointing that I only drove the SV on the track, not on the road. The residents around Barcelona are poorer for not seeing a dozen candy-colored ultra-exotics wheeling around their lanes and highways. On the other hand, I could feel the stiffness of the car, even at Catalunya where every ounce of rigidity makes for a faster car. I don’t know if the handling upgrades will be a positive thing for the 600 eventual owners flossing their SVs in urban environments, but they surely quicken the car on the circuit. Very often the exterior modifications to high-performance variants make little to no difference in terms of capability. Some cooler-looking brakes here and unused high-speed stability there, but nothing in comparison to adding power or deleting weight. With the Superveloce, however, the perfected aerodynamics of the car make it radically better, at least on a circuit. Lamborghini engineers meticulously trimmed lift and dialed in downforce with front and rear wings, while massaging airflow under the car with a smoother undercarriage. You thought that piss-off-huge carbon-fiber rear wing was just a styling flourish? Not hardly. These aero refinements are precisely what gave me the advantage over Müller in Turn 3, according to the man himself. Who knows, Lamborghini signs Pete Müller’s paycheck, so there’s every chance that my catching him on a fast sweeper was all part of a subtle PR campaign to sell me on the Aventador Superveloce. Yet I’d fallen for the car long before that. Lap after lap the car encouraged me to go faster, harder, and smoother over that particular and wonderful surface of the Earth, swaddled in the protective shell of passionate Italian race engineering. If he duped me or he didn’t, I’d say that makes Müller an excellent coach, and this Lamborghini a monumentally good one.